A few years ago, while working as a tour guide in Yunnan, I had a guest who – every morning – insisted on “not eating lunch for breakfast”. She had travelled in China before, and had been made to start each morning with a hearty, savoury meal, a bamboo basket of steamed dumplings, say, or a bowl of spicy noodles, when what she really wanted was some cereal and a croissant. Fortunately for her, we packed a carload of breakfast cereal for each trip, because she’s not the only one who is a culinary conservative when it comes to starting the day. Take me as an example – for years now, I could have been breakfasting on dumplings and noodles, and while I can eat that for breakfast, I still find myself making ridiculous detours to bakeries and cafes to get a cup of coffee and some toast in the morning. What breakfast foods will you make a detour for? Congee – rice cooked in water until it disintegrates into a thick gruel – is eaten right across Asia, from India to Japan. It’s used to wean infants, fed to invalids, and eaten first thing in the morning and last thing at night – a universal comfort food. Congee can be eaten plain (with a deep-fried youtiao dough stick for flavour and crunch), or flavoured with traditional combinations of ingredients – thousand year-old egg and strips of pork, a raw egg and beef, or chopped spring onions and coriander (my favourite). 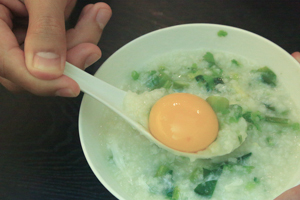 The recipe below is for two big bowls of plain congee. I made this in our medium-sized rice cooker and it still made a big bubbling mess of the worktop – make sure you have plenty of room in the pot if you want to make double quantities. The ratio of rice to water looks a bit silly but – trust me – it all works out in the end. With a rice cooker: Put everything into the rice cooker, and put it on the boil setting. Leave for an hour, then season and serve. How easy was that? With a saucepan: Put everything in the pan, bring it to the boil on a high heat. Reduce heat to a medium-low setting, and cook, uncovered, for an hour until the rice has broken down and the congee is creamy. Season and serve. Thanks for the congee recipe! Look forward to minding it in Nz winter! How was the broad bean congee? “Breakfast in Dali” brought back sweet memories of my 6+ weeks stay in Dali in 2007. I came to Dali at the beginning of my sabbatical leave and got stuck there for the whole duration of it – I discovered kung fu 🙂 I stayed at a GH on the Renmin Lu, at 60 RMB/night for the room. I had two breakfasts, one in the early morning (before training) and another – a leisurely one, after the training. The first breakfast was just porridge cooked in my room (as none of the staff would be awake before 8 or 9 am, and I started my training at 8). The second breakfast was toast, boiled eggs and Yunnan coffee – all locally made, no fancy German Bakery breads, just plain Chinese white bread from the supermarket (which tastes like sweetened paper). Nevertheless, that sweet paper bread was so delicious… after a gruelling two hour kung fu training with Ma Shifu. 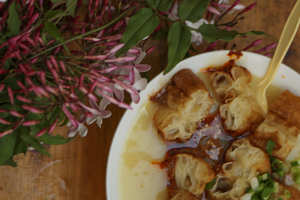 I’ve been wanting to make Congee since I left HK, thanks for this simple straight forward recipe! You’re welcome 🙂 Hope it tastes as good as you remember!